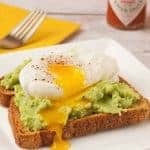 Whole wheat toast topped with lightly-seasoned, mashed avocado and a poached egg makes a delicious, satisfying breakfast. Cut the avocado in half lengthwise, remove the pit and scoop the flesh into a small bowl. Add the lemon juice and hot sauce and season to taste with salt and pepper. Toast the bread until lightly browned, then divide the avocado mixture between the 2 slices. Spread evenly, making a shallow well in the center for the eggs. Top each piece of toast with a poached egg, sprinkle with a little extra salt and pepper and serve immediately. Crack each egg into a small prep bowl and set aside. Bring a small saucepan of water to a rapid simmer over medium-high heat. Add 1 teaspoon of white vinegar and slowly the stir water to create a gentle whirlpool effect. Gently add an egg by dipping the side of the prep bowl into the water and sliding the egg out. For a runny yolk, cook for 1-1/2 to 2-1/2 minutes, then carefully remove the egg from the water using a slotted spoon. Touch the bottom of the spoon to a clean towel to wick away excess water and serve immediately. Start with very fresh eggs and cook no more than one or two at a time.